As big as the SUV market is right now, it’s still growing, and more are jumping on the bandwagon. 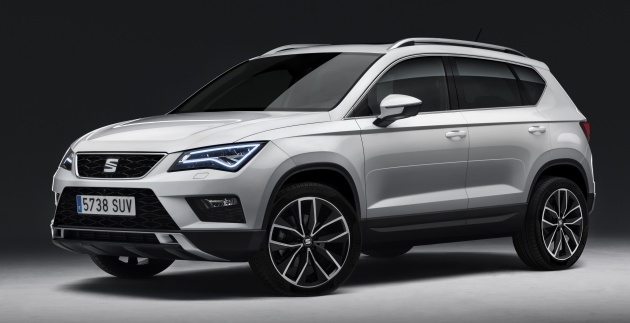 Seat launched its first ever SUV earlier this year, the Ateca (pictured), and will follow up with a smaller one based on the upcoming new Ibiza next year. It will be called the Arona, and it has been confirmed to debut at 2017 Frankfurt show in September, Autocar reports. The Arona is named after a city on the Spanish island of Tenerife and will be built at Seat’s Martorell headquarters in Barcelona. Like the upcoming fifth-gen Ibiza, the B-segment SUV will use the A0 platform from the VW Group’s modular MQB architecture. The Ateca’s smaller sibling should follow the same angular look, which will set it apart from classmates such as the Nissan Juke and Renault Captur. “The Leon, the Ibiza and the new Arona, together with the Ateca, are going to strengthen Seat from a commercial, financial and brand image standpoint. 2017 is going to be a very special year for Seat,” Seat boss Luca de Meo said.